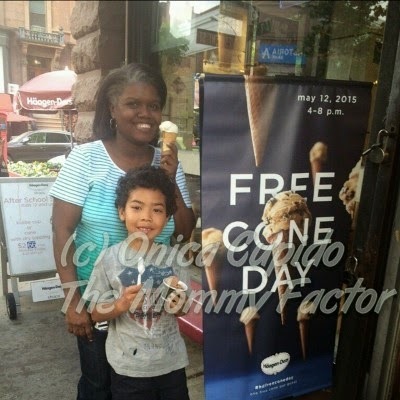 This week we visited our local Häagen-Dazs Shops to enjoy their “Free Cone Day”! While getting to enjoying any flavor of Häagen-Dazs ice cream is already a treat, this was a double treat because I received a first taste of the new flavors from the new Häagen-Dazs Artisan Collection: Banana Rum Jam and Chocolate Caramelized Oat Ice Cream. While my son opted for classic chocolate ice cream. I had to try the Banana Rum Jam. Since I'm a fan of the Häagen-Dazs Rum Raisin ice cream, I wanted to see how they changed the flavor. I have to say Banana Rum Jam flavor is much lighter in taste and more on the banana side then rum. I think I need more scoops to give a full description but overall it's a good ice cream choice for summer. Tres Leches Brigadeiro: Based in New York City, Paula Barbosa of My Sweet Brigadeiro™ teamed up with the Häagen-Dazs brand to deconstruct her Happy Couple™ brigadeiro—a modern spin on a traditional, celebratory sweet from her native Brazil—to make a decadent sauce and swirl it into creamy tres leches ice cream. Banana Rum Jam: After a cold winter in Brooklyn, New York, friends Sabrina Valle and Jessica Quon of The Jam Stand® were determined to create a homemade jam, despite many fresh fruits being out-of-season. After some experimentation, they prepared their first jam called Drunken Monkey™, a new play on the classic Bananas Foster. Inspired by their homemade classic, Banana Rum Jam ingredients are swirled into a decadent vanilla bean ice cream. Chocolate Caramelized Oat: Claire Keane of Clairesquares® in San Francisco has been crafting delicious flapjacks—a traditional Irish treat of caramelized, buttery oat bars drizzled in chocolate—from her own recipe since she was twelve years old. Inspired by her Irish treats, the Häagen-Dazs brand took chocolate caramelized oat clusters and blended them into a rich caramel ice cream. Spiced Pecan Turtle: Offering an international twist on classic chocolate turtles, Christopher Elbow of Christopher Elbow Artisanal Chocolate™ in Kansas City, Missouri, co-created this new artisanal flavor to include roasted pecans with cinnamon and chilies and swirls of caramel sauce with rich chocolate ice cream. Ginger Molasses Cookie: Taking on an American classic, Anna Gordon of The Good Batch® in Brooklyn, New York, worked with the Häagen-Dazs brand to craft a vanilla cinnamon ice cream infused with the sweet, warm flavors of her soft-baked ginger molasses cookies. Applewood Smoked Caramel Almond: Striking the perfect balance between sweet and savory, Cruz Caudillo of Praline Patisserie® in San Diego, California, worked with the Häagen-Dazs brand to create swirls of smoked applewood caramel sauce combined with roasted, salted almonds into a sweet cream ice cream. Häagen-Dazs Artisan Collection ice cream can be purchased at retailers nationwide. All flavors are available in 14 oz. cartons at a suggested retail price of $5.29, and Tres Leches Brigadeiro is also available in a 3.6 oz. cup at a suggested retail price of $1.49.